When I was looking into how to use WebAssembly (WASM), I kept asking myself: How can I pass my variables back and forth from the WASM module? While you can pass some primitives back and forth quite easily, I was a bit confused how things like arrays could be passed to and from the WASM. Then it dawned on me. I’m working with a lower level language here. Assembly doesn’t have arrays. What I need is memory access. There are a number of steps to get WASM ready to be run in the browser. The two big differences here are the variable types and the memory access functions. Let’s break down some of the code. The i32 designates this as a 32-bit integer. The number of bytes in a 32-bit integer is 4. Bytes are 8 bits, which means 4 bytes are needed for a 32-bit int (4 x 8 = 32). This unit size will become important when we start accessing the memory. The store function saves values to memory; in this case we are saving 32-bit ints (i32). store takes two parameters. The first parameter is a pointer, a memory address. This is the exact same idea as store, but in this case, we are accessing memory. This function would access the previously made Fibonacci number. source code, specifically the build.js. WebAssembly always allocates memory by pages. Pages are always 64Kib in size. This logic calculates the number of pages needed to calculate the target Fibonacci number. It then allocates that memory, so that it is ready to be used by a WASM module. 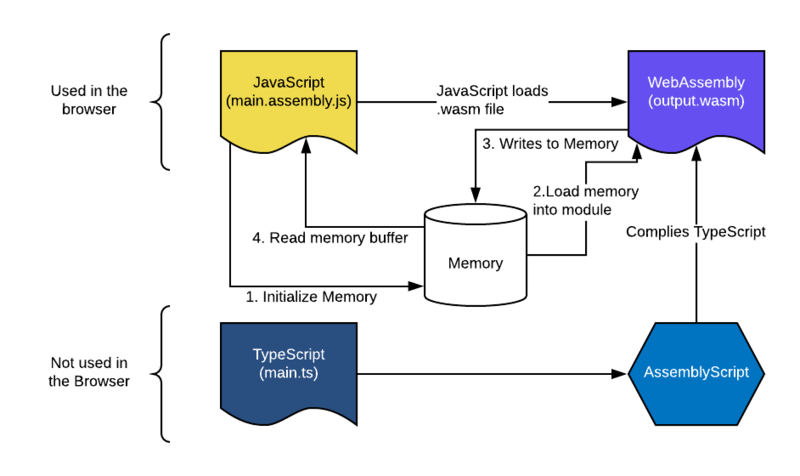 You can read more about WebAssembly memory here. This code snippet is pretty straight forward. We fetch the .wasm file output and push the resulting buffer into WebAssesbly’s instantiate function. Notice that the second parameter of the instantiate function has the memory that we just allocated. Once you create the WASM module, all of your exported functions from your TypeScript logic will be on module.instance.exports. In this case, we can just run the exported function. This should load all of the Fibonacci numbers into memory. Luckily we can access that memory buffer with memory.buffer. Using this buffer, we can initialize a new Uint32Array. Why 32? That’s because each of our Fibonacci numbers are stored as 32-bit ints. Finally, we can console.log out our hard work using some array functions to slice out the part of memory that was written. While the source code is working, it might have some differences from what I explained here in the blog post. This was mostly due to the fact that I wanted to test if web assembly could offer a performance boost. At least in this example, it looks like AssemblyScript/WASM is a bit slower, however, not by much. When storing and loading information with AssemblyScript remember your unit sizes in bytes! You will need to do some pointer arithmetic!